Peekko Chat is a new Firefox extension that makes every web page a place where people can congregate. It adds a toolbar to Firefox that shows how many people are in that page's chat room and allows you to instantly connect with them. Peekko lets you chat with other people viewing the same site as you. 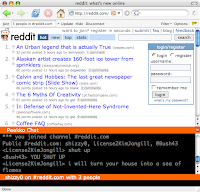 By default, Peekko connects to a chat server when Firefox starts. As you surf the web, Peekko queries the chat server for a channel based on the website you are viewing. You can join that channel and chat with other users who are at the same site. What software is the chat server running? The chat server is a standard IRC server. IRC stands for Internet Relay Chat. You can find a short prelude on IRC here. You can find a lot more about IRC here. Stop Yahoo! from Tracking You! Possible features of Windows Live Messenger 9 ? Webcam can reveal your secrets ! Blogger accounts might be hacked ! iMessengr is back in town ! Create a Gmail Account - now open to everyone ! AGLOCO - Be paid for your online activity ! How to delete yahoo messenger archive ?